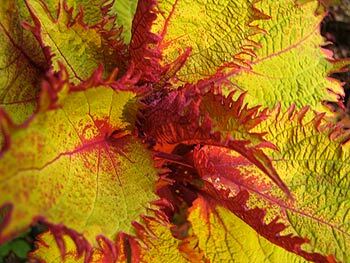 I can’t think of a genus of plants grown for foliage that has more to offer than Solenostemon, hereafter “Coleus,” since no one in the world refers to this genus by its Latin botanical name. Coleus you know. But have you planted Coleus lately? 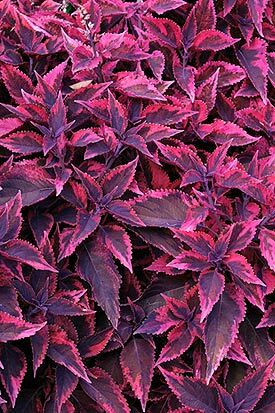 Two reasons I consider Coleus highly valuable: One, they grow in part shade/shade, and are a mainstay of shady beds, shady containers and shady window boxes. Two, in the last five years, the nursery nerds have devoted thousands of hours and millions of dollars to developing varieties that grow in part to full sun. Meaning today, one can grow these fabulously colorful plants anywhere in the landscape. Singles work great popped in here and there throughout the perennial garden. In containers, they rule. I did two large church container boxes, flanking the front door, with five varieties, 15 total plants in each box, and by early July the entrance to the church was the most glorious explosion of color you’ve ever seen. You’ll have to trust me, I never had my camera as I drove by, and of course am incapable of remembering that I have a camera in my phone. 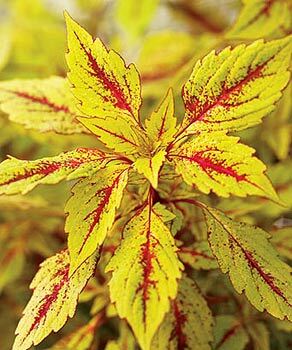 A great trick: At the back of the perennial border, raise up a container on bricks or some form of pedestal (needn’t be fancy), then plant one of the taller coleus varieties in the container. Or do it three or five times along the back. By midseason, you have four-foot coleus looming in the background, with the perennials in front hiding the container and pedestal. 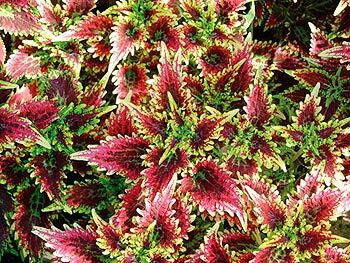 Considered annuals in the US and Canada, coleus are actually perennials, and are easy to over-winter. Dig the plants, pot them, and bring them inside before frost. Check the plants closely for insects and treat if needed. Pinch the plants down by half. Place in a bright area in the home. Add humidity by setting the container in a saucer filled with pebbles, with water to the top of the pebbles, or mist once a week with a spray bottle. Never fertilize, and water only once per week, or when top of soil is fully dry. Plant outside in spring after frost danger has passed. Always pinch off the flower spikes that begin to appear on plants in midseason. The blooms are OK, usually blue, but as soon as plants bloom they get tired and lose their vigor. Pinch the bloom spikes once per week and plants will continue to kick out fresh new leaves into late fall. I’ve had plants in light shade grow 32” tall with a 26” spread. When shopping at the nursery, Proven Winners™ far and away has the best and widest variety of shade, part shade, part sun and sun coleus. Photos (except the top one) courtesy of the Proven Winners™ Photo Gallery.